Can the Mediterranean diet provide protection against dementia? Today I'd like to welcome a guest post by Annabel Matison, who is currently studying a Master of Human Nutrition at Deakin University. Before making the switch to studying nutrition, she worked in finance in the food industry. An interest in understanding how the foods we eat impact our health, led to her change in career path. Promising new research suggests that following a Mediterranean diet may help reduce your risk of developing dementia. If you’re anything like me, the word ‘dementia’ fills you with fear. I want to spend my retirement years travelling and playing with my grandchildren. Not relying on someone to take care of me. Like me, you probably think that there’s nothing you can do to protect yourself from dementia. That is, until I read some promising new research suggesting the Mediterranean diet may help delay dementia by up to 5 years. We all have some level of decline in our brain health with age including memory impairment. I can’t always remember where I’ve left the keys. Dementia sufferers experience more decline than is expected with normal aging. Researchers have studied the brains of people with dementia and found that they display greater brain atrophy (shrinkage) and have higher deposits of a substance called cerebral Aβ-amyloid. Cerebral Aβ-amyloid is a plaque which deposits in the blood vessels of the brain, restricting the flow of blood. What does research into the Mediterranean diet show? Recent studies following elderly participants over a 3-year period have found that people consuming high levels of food from the Mediterranean diet, experience less brain atrophy and accumulate less cerebral Aβ-amyloid. These new studies support previous large-scale research into brain health in older participants. Substantial evidence suggests high intakes of Mediterranean foods leads to better brain health. The Mediterranean diet contains high levels of fruits, vegetables and fish. It is thought that the antioxidants and anti-inflammatory properties in these foods protect the brain from dementia. Based on the latest research, the Mediterranean diet is a promising way to reduce your risk of dementia. 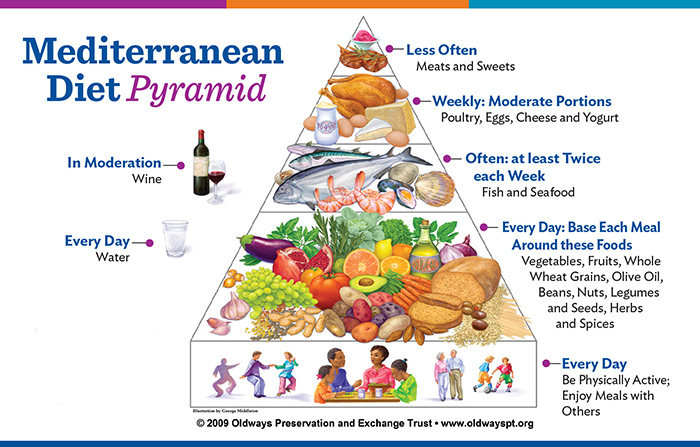 So, if like me, your worried about your risk of dementia, give the Mediterranean diet a try. If you’re concerned about an older relative, give them a hand making changes. And it’s not just my advice, a panel of U.S. health experts including nutritionists and dietitians, named the Mediterranean diet the 2019 best overall diet!